I couldn't agree more ... life is meant to be FUN! I had a great time with my siblings and parents last week. 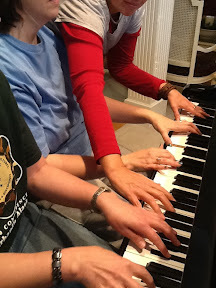 Besides lots of game playing, my sisters and I spent an hour or so at the piano. My sisters are both really good - I'm a moderate pianist. That meant enough mistakes to make it super fun and create a ton of laughs! "Don't ever become a pessimist... a pessimist is correct oftener than an optimist, but an optimist has more fun, and neither can stop the march of events." Beautiful message! Life is short and should be enjoyed to the fullest! your family is amazing Denalee! By the way thank you for help with our adopted family... you are an angel! I have wonderful memories of my mother playing the piano. She taught me a bit and that gave many years of fun. My mother is a church organist and pianist (and plays flute, drums, viola and few other things). I have many fond memories of sitting beside her before church when she was warming up as well as fun times on a holiday singing songs. Thanks for the quote or i should say reminder... So simple yet so true! Merry Christmas Denalee!